Waterfalls? In the desert? Why, yes! And seven of them, no less. 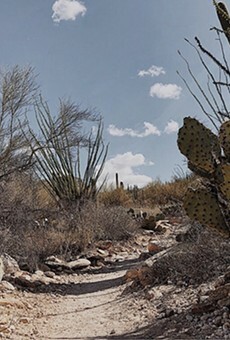 The Seven Falls trailhead is accessed via the Bear Canyon Trail in the Sabino Canyon Recreation Area parking lot. It's 7.8 miles round trip, and if you attempt the hike in the warm summer weather you'll be rewarded with pools of refreshing, cool water. Wet down those clothes and hike back to the car dressed as a living swamp cooler. The falls boast higher output in the early spring due to snowmelt, as well as late summer after a good monsoon rain shower. If you're wanting to get in touch with Tucson's outdoor scene, this is one heck of a way to do it.